This is part three in a seven part series on finding the right locations. So now that we had our village, our base so to speak we could start working on everything else. Choosing Alfriston as our Ambleton would colour and influence all our other choices in locations. Such as our restaurant, our general store, Chris’s home and so on. We also wanted where and when possible to have locations that were “two for ones” as in both the interior and exterior of the location were appropriate and fortunately we did just that. This logistically made filming that bit easier saving us time and extra shoots . 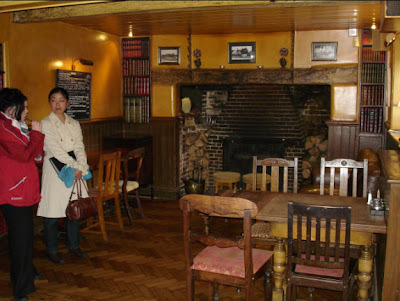 For us it was imperative that all our locations were seamless and that even though for example Chris’s house was actually in Brighton and The Rainbow Inn, is in Lewes their interiors and exteriors aesthetically had to fit and feel like they were part of and belonged to the village in Alfriston. Finding our “Amble Inn” was no easy task after a lot of research we had a list of 30 or 40 that on paper at least were maybes. We spent two full days driving around almost all of East Sussex. location scout at The Rainbow Inn. On visiting them however they just didn't fit the bill. They were either too small, the decor wasn’t suitable, they would be impossible to film in and the list just went on and on. 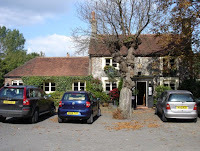 We finally narrowed it down to two possibilities - one a restaurant in Alfriston itself and the other The Rainbow Inn just outside Lewes. I made up my mind instantly and fell for The Rainbow Inn. From a production designer point of view, in my mind’s eye aesthetically it was exactly what I was looking for. It had character, warmth and charm with its unmatching chairs and great little quirky details. It was traditional but had subtle modern touches here and there. I knew it would look great on screen and I could completely envision and believe John and Kate living and working here. 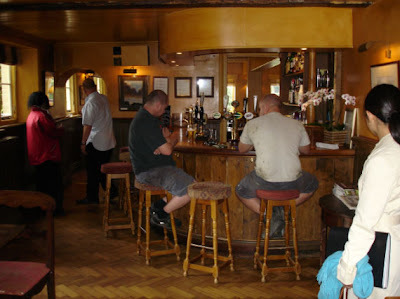 was to become the famous bar in the film. I was absolutely convinced that it was perfect and trusted my instincts on this but had to a little bit of persuading. Dan (director) had reservations at first and rightly so, it wasn’t completely open plan as we had initially wanted. Also filming wouldn’t be easy and he had to rethink and work out potential alternatives. Fortunately for us though, he is a little genius and he worked out ways it could be done. Success! The wonderful Rainbow Inn as seen in the film.